Julie Geller, a singer and songwriter whose music video we featured on Rosh Hashanah, has come up with another song that reminds us that the Chanukah miracles of the oil and the Maccabees' victory are not the only ones that we have experienced. In fact, miracles are happening all around us every day, as she reminds us in very personal ways. I think that miracles are everywhere. It is just a matter of opening our eyes to them. Often it takes the loss of a something to realize that what we were able to do before was miraculous. I think it is most powerful when we can appreciate miracles as they occur rather than only in hindsight. The one certainty about life is that it is constantly in flux. We never know how long anything, including our lives themselves, will last. For this video, I sent out the word asking for people to send in videos of themselves holding up signs describing miracles that have occurred in their lives. As you can see, the arc of human experience is vast. When we open our eyes to miracles, we open our hearts to life itself. Let us all rejoice in all of our miracles - those historical and those taking place today (bayamim hahem barman hazeh), the small ones and the large ones , those that catch us by surprise and those we have come to expect. Enjoy and Shabbat Shalom from Jerusalem! Well, the day we've all waited for is finally here. And after running nine music videos and comedy sketches focusing on the unusual coming together of Thanksgiving and Chanukah, we're saying goodbye to the once in 77,000 year holiday with one last music video. This one is by Six13, the a cappella band that we've featured in previous holiday music videos. Six13 is a six-man vocal band that brings an unprecedented style of Jewish music to the stage, with songs ranging from hip-hop dance tracks to rock anthems. The members of the New York-based group sound like a full band – while using nothing but their voices. Six13 has recorded four award-winning albums, whose songs have been played all over Jewish radio and been chosen to appear on nine different “best of” compilation albums. The group has over 20,000 CDs in circulation, and are among the top Jewish music artists on iTunes. They have received several distinctions and accolades from Jewish organizations like the National Council of Young Israel and Moment Magazine, and awards from musical organizations like the Harmony Sweepstakes and the Contemporary A Cappella Society of America. 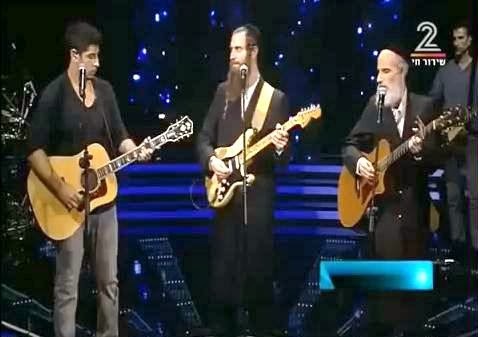 They have appeared on the Chabad Telethon, and were chosen from hundreds of groups, both Jewish and secular, as finalists in the casting process for NBC’s hit prime-time television series The Sing-Off. The group has also become a viral internet sensation, with over one million views on YouTube. As we get ready to light the turkey and stuff the menorah (oops, we meant the other way 'round) on the first night of Chanukah, we are bringing our Thanksgivukkah coverage to a close when the dual holiday finally arrives tomorrow. Please bear with us for two more posts about this rare holiday. We promise that after tomorrow we'll be focusing on Chanukah alone and leaving Thanksgivukkah to the history books. 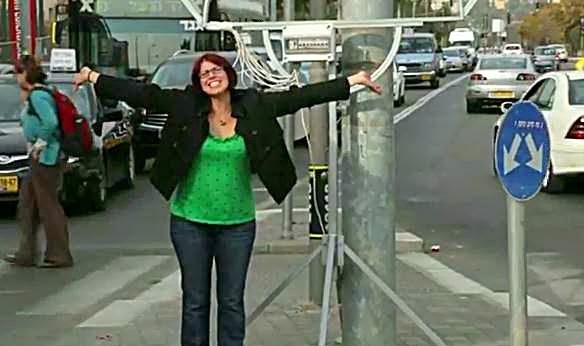 Today's post features Molly Livingstone, Jerusalem comedian and co-founder of the HaHafuch improv troupe as she heads to the streets of Talpiot in Jerusalem for a set of impromptu interviews of unsuspecting subjects who happen to be in range of her microphone. Hasidic comedian Mendy Pellin has done it again. After the success of his hilarious rendition of "Why Moses Hit the Rock" his Jewbellish troupe brings us the "real" story of what happened at the binding of Isaac on Mount Moriah. According to this comedy midrash, Abraham was "punked" (made the object of a practical joke) by God and a team of angels into thinking he was commanded to sacrifice his son, Isaac. It turns out that it was a gag and Isaac was in on it the whole time. There's a funny side reference to the possibility that Abraham had been punked previously when he was commanded to circumcise himself. The whole midrash is a hilarious retelling of two of the most famous Bible stories. A Joke to Start the Week - "Suit For a Shlemiel"
This is a big week for music videos to celebrate Chanukah, Thanksgiving, and Thanksgivukkah. But it's Monday morning, and that means it's time to take a break and return to our tradition at Jewish Humor Central to offer a joke to start the week. And like most jokes, this one has nothing to do with Chanukah or Thanksgiving. But we hope it will give you a smile to start the day and the week. 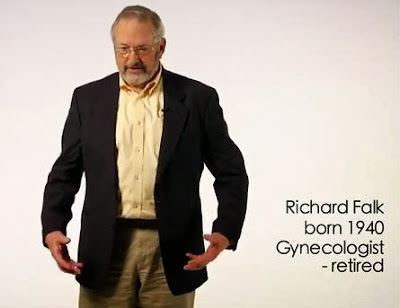 Today's joke comes from the Old Jews Telling Jokes collection and features Richard Falk, a 73-year-old retired gynecologist. Because of the convergence of Chanukah and Thanksgiving Day this year, we're seeing lots of new music videos created for the occasion, by musicians and parodists old and new. We've been posting them as they come in, using some discretion to bring you only the ones we think are the best, and anticipating a reprise of all of them at the end of Chanukah to give you a chance to vote for the best one. 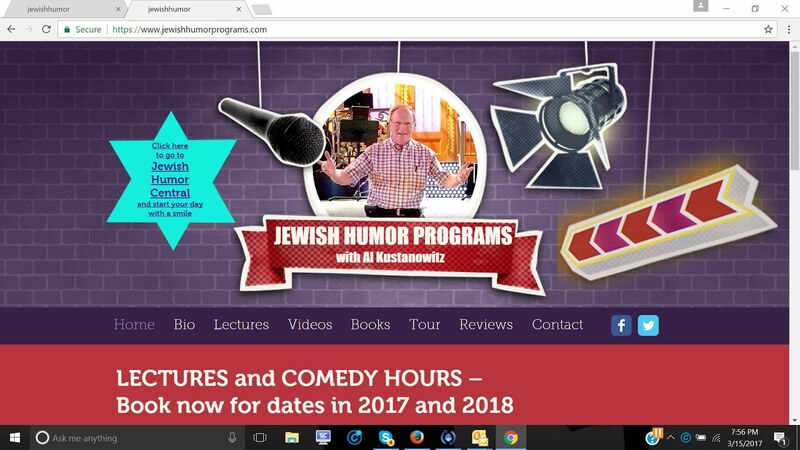 We were hoping that some of our favorite comedians and parodists would join the fun and we were very happy to see that Benji Lovitt, an American comedian who relocated to Israel seven years ago, has produced Thanksgivukkah Pie, a funny animated parody of American Pie. The original song, by by folk rock singer/songwriter Don McLean, was a number one hit in 1972. It's a recounting of the aftermath of the 1959 plane crash that killed Buddy Holly, Ritchie Valens and The Big Bopper. Just in case you want to add some fun to your Thanksgiving celebration by singing Benji's song, we're including the lyrics just below the video. Hasidic guitarists and singers Gil and Aryeh Gat, recent favorites of ours and many of our readers, keep appearing on the Rising Star TV show in Israel. 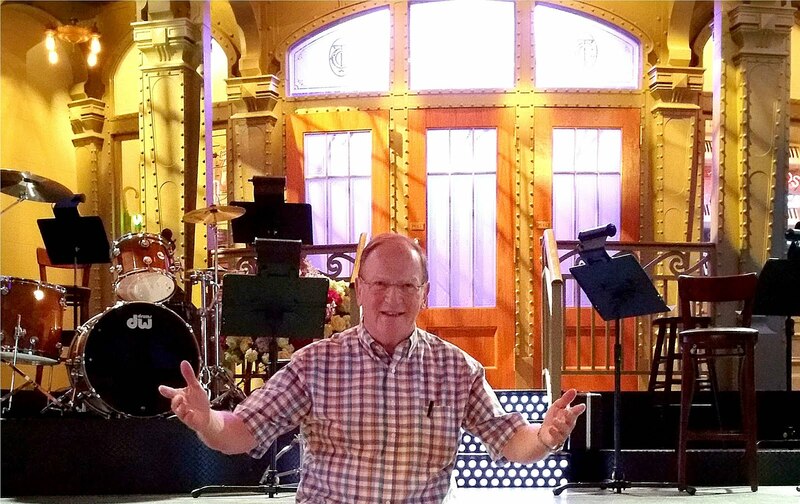 After turning in crowd-pleasing performances of songs by the Beatles, Simon and Garfunkel, the Eagles, and Pink Floyd, their appearance last week gave them an opportunity to show their talent in performing songs from traditional Jewish sources. Who desires life, loving each day to see good? Then guard your tongue from evil and your lips from speaking deceit. Turn from evil and do good, see peace and pursue it. As we prepare for Shabbat in Jerusalem, we wanted to share this Gat Brothers performance. What happens when four words (Hasidic, puppet, rock and band) that you would never put together in a sentence combine to provide a unique entertainment that makes sense once in 77,000 years? Their song, complete with lights, sound, and of course, puppets in Hasidic dress, is a parody of a pop culture song called Scream and Shout, that reached 311 million page views on YouTube. Don't ask us how; we only heard the song for the first time today. The one thing that separates this video from the ever-growing number of Jewish parodies on YouTube: the band members are Hasidic. They’re also puppets. The band name Buba Myses, Yiddish for “grandma tales,” is also a play on the Hebrew word buba, which means puppet. But as much as the presentation is impressive, I’ve gotta say that the character I identify with most is the bewildered guest. If I came to a Thanksgiving dinner only to be greeted by a bunch of Orthodox puppets, I’d be pretty confused, too. With Chanukah and Thanksgiving Day arriving together next week, the city of Boston is going all out to insure that both holidays get the attention that they deserve. The whole city, including the mayor, are all set to celebrate in ways both traditional and new. 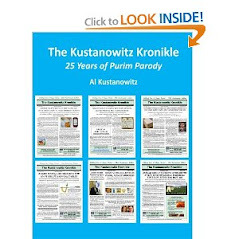 The website JewishBoston.com created a special additional website for the occasion and filled it with historical information, recipes, a page for kids, and instructions on setting the Thanksgivukkah table. 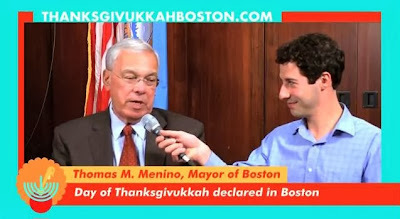 They sent a reporter into the street to capture reactions from people in the street and to interview Thomas Menino, Boston's mayor about how they plan to celebrate, pronounce, and spell Thanksgivukkah. So join in the fun, and enjoy! 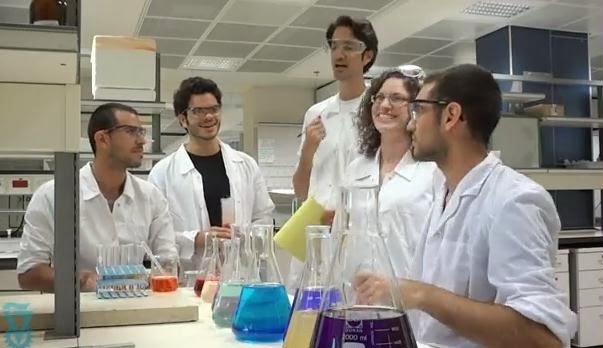 Haifa's Technion - Israel Institute of Technology can always be counted on to come up with clever and inventive ways to welcome Jewish holidays. This Chanukah is no exception as the students of the Technion's General Chemistry Student Laboratory bring us their version of the traditional Chanukah song Maoz Tzur. What's their innovation this time? Filling laboratory flasks to different levels producing the notes of the musical scale, in effect creating a new instrument. A Joke to Start the Week: "Israeli Rowing Team"
Here we go again. It's time to start off another week with a joke. It's definitely not a new one because as we often say, there's no such thing as a new Jewish joke. But the old ones keep us laughing every time we hear them. This oldie but goodie is one of our favorites, especially as we head to Israel for a month of looking for funny situations to share with you. Today's joke teller is Paul Eisenman, another veteran of the Old Jews Telling Jokes ensemble. 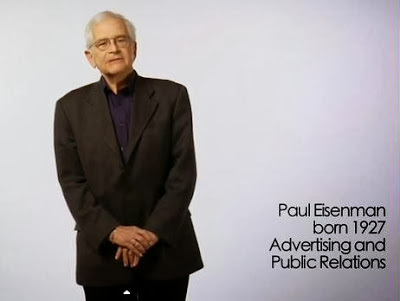 He's 86 years old with a career in advertising and public relations. Before music videos with parodies of popular songs appeared on the Internet, the most frequently played Chanukah songs were I Have a Little Dreidel and Chanukah, Oh Chanukah. The latter typically showed up in three versions, the original Yiddish ("Chanukah, oy Chanukah, a yom tov a sheiner, a lustiger a freilicher, nisht do noch a zeiner..."), the Hebrew ("Yemei HaChanukah, chanukat mikdasheinu, b'gil uv'simcha me'maalim et libeinu...") and the English ("Chanukah, oh Chanukah, Come light the menorah, let's have a party, we'll all dance the hora..."). With the first day of Chanukah coinciding with Thanksgiving this year, songwriters everywhere are rushing to publish new versions of this classic song that blend the two holiday traditions. 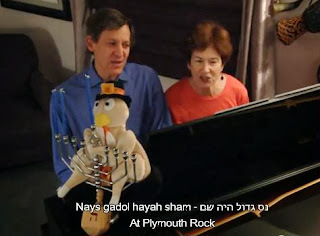 A rendition with some of the best lyrics we've seen so far and retitled The Thanksgivukkah Song was created by Gil Brodsky and in the video below is performed by Gil and Margie Brodsky, We're including the lyrics just below the video. And lighting the candles we gloat. Pumpkin pie and some sufganiot! With songs and with cheers. 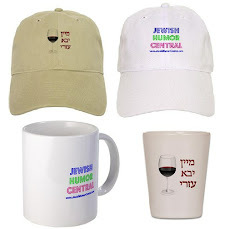 Over the four years of Jewish Humor Central's presence on the Internet, we've collected and posted more than 1200 jokes, funny happenings, and humorous tastes of Jewish culture. 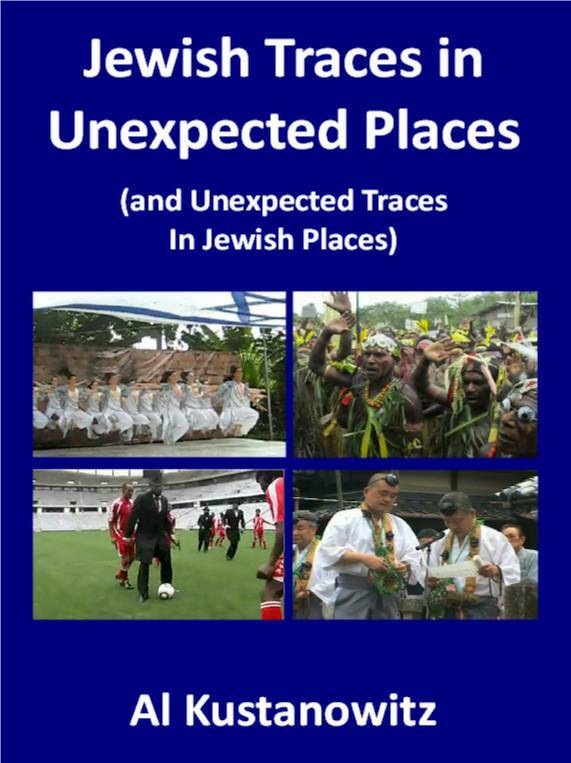 The mix included hundreds of anecdotes with a connection to the land and people of Israel. 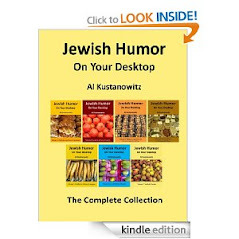 We selected the best of the bunch, some 120 blog posts with associated video clips, and published a book about them called Israel is a Funny Country. The book, containing links to more than six hours of Internet video, went on sale this week at Amazon.com in both paperback and Kindle (e-book) versions. The price of the paperback version is $8.99 and the Kindle version is $5.99. As part of the book launch, Amazon is making the Kindle version available free ($0.00) to everyone for this weekend only (Friday November 15 through Monday November 18, 2013. After the promotion is over, the regular prices go back into effect, but with Amazon's new BookMatch program, anyone who buys the paperback version will get the Kindle version free (no time limit on this offer). This is a great opportunity to get these 120 video gems on your Kindle, iPad, tablet, iPhone, Android and BlackBerry smartphone, PC and Mac, and access them whenever and wherever with the free Kindle Reading App provided by Amazon. 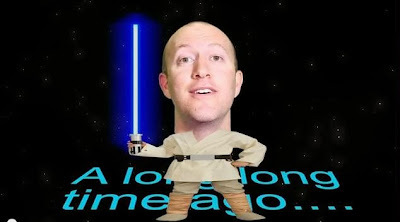 The unusual concurrence of Thanksgiving Day and the first day of Chanukah this year has resulted in an outburst of creative music videos, comedy routines, satire, and parody. Some are individual efforts and some are ensemble performances. But this is the first time we've seen what looks like an entire school -- faculty, staff, and student body -- all participating in an extensive production. 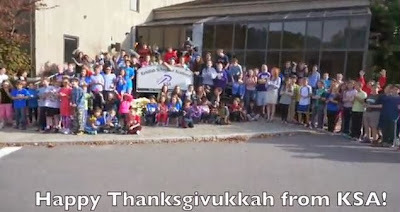 Kehilla Schechter Academy in Norwood, Massachusetts is really getting into the spirit of the two holidays by performing The Ballad of Thanksgivukkah, an original production number by Rabbi David Paskin, the Head of School. (Lyrics and performance schedule are on the school's web page.) Also known as the Rock n' Roll Rabbi, he has won wide praise for his accomplishments across the spectrum of Jewish life, as a rabbi, educator, and musician. Here's the school performing The Ballad of Thanksgivukkah. It's energetic and uplifting. Too bad it's not going to be performed again for another 77,000 years! Juliana Margulies, star of the CBS TV show The Good Wife, was David Letterman's guest this week on his late night show. The conversation was about holidays, and where and how she celebrates them. Margulies says that her favorite holiday is Thanksgiving, and that she's responsible for hosting the day for her family. When Margulies says that she and her husband get on a plane every Christmas morning, Letterman implies that it's an odd way to celebrate Jesus' birth. Margulies clues him in about Jews traveling on Christmas. She reveals her strategy for finding an empty plane, only to find that other Jews have the same idea. We don't know if Letterman's apparent surprise at her approach to Christmas is real or a put-on for laughs, but either way, it's a funny moment. "A tale of stereotypes gone completely out of control." That's what the narrator of this parody movie trailer says in the tone that we've become accustomed to hearing in most movie trailers, especially for horror films. But this is no ordinary horror film. It's a parody, a satire, a spoof of the horror film genre applied to the unique concurrence of Thanksgiving and Hanukkah this year. 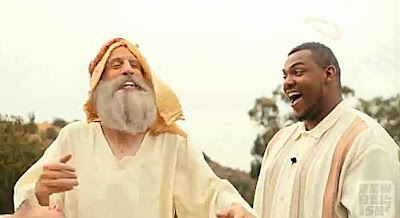 The mock movie trailer is a product of the zany comedic minds of Yisrael Campbell, the Catholic convert who became a Hasidic comedian and Gary Rudoren, director of the Jerusalem-based improv comedy group Hahafuch. “The Sullivans’ Thanksgiving Day is about to become eight days of hell,” the voiceover announcer says as Campbell, his wife and many children show up at the door. “Are you ghosts?” asks the teenage daughter of the non-Jewish family. “No, we’re the Rosenblums,” answers the Jewish mother in a sinister nasally voice. So enjoy, and remember...it's a parody. A Joke to Start the Week: "Air Conditioning"
It's Monday morning. Time to share another old joke from the archives of Old Jews Telling Jokes. 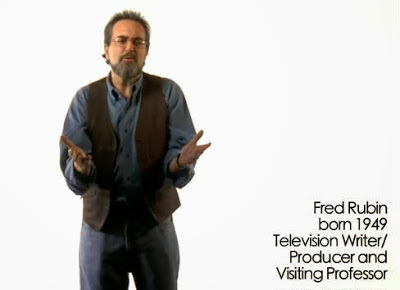 Today's jokester is Fred Rubin, a 64-year-old television writer, producer, and visiting professor. Here's the setup: Around the 1920's three Jewish brothers, Norman, Hyman, and Max Schwartzman, invent this miraculous machine that can instantly cool the air in a room. Back in 1961 a musical called Subways are for Sleeping with book and lyrics by Betty Comden and Adolph Green and music by Jule Styne debuted on Broadway. Last week the phrase took on new meaning as a photo snapped on a New York City subway train went viral on the Internet. 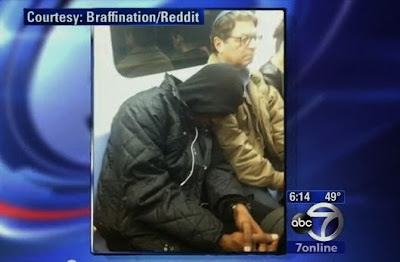 As reported on ABC-TV Eyewitness News, a young African-American man wearing a hoodie fell asleep on the shoulder of a man wearing a yarmulke and continued to snooze for a half hour as the train rumbled along. Isaac Theil, a retired accountant, was headed home on the Q subway train to Queens when the passenger sitting next to him rested his head on Theil's shoulder. Sensing a New York moment, an unidentified photographer captured the image and uploaded it to the Internet. Another rider was amazed at the scene — a black man sleeping on the shoulder of a white man in a yarmulke — so he gently asked if he wanted help to wake the slumbering straphanger. "He had a long day so let him sleep. We've all been there," Theil responded. The other rider captured the moment with a quick cell phone picture that he then posted online with a brief explanation. The picture and caption has gone viral on the Internet, with 1.3 million “likes” and 172,563 shares on Facebook. It’s also received a whopping 228 comments on reddit, where it was originally posted. "There's still hope in humanity," said Facebook user Michael Bartley, whose comment alone got 13,583 likes. "I don't see a black man and a Jewish man — I see two people," added Georgina Gainsford-De Giogrio. Theil, an Orthodox Jew, is surprised by all the attention — and there was a lot of it, thanks to social media. "I just kept steady so he would be able to sleep," said Theil, who had been returning home from watching his granddaughter on the Upper East Side. "It wasn't easy to do because he was dead weight." And the reddit user who started it all is amazed how it has become an international sensation. "It really wasn't about the ethnicity of the people," he told The News, asking to remain anonymous. "It was just more that New Yorkers, especially in the subway, don't want to touch people or have them get in their personal space. That was striking to me and made me smile and I thought was a very nice gesture." Alas, the unidentified man wasn't able to doze off the whole ride because Theil had to exit the train at Newkirk Ave.
"I didn't want to scare him awake," Theil recalled. "I turned around to look at him and he was dazed."